We look at some of the options for lowering blood glucose in the short term. 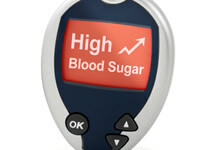 High blood sugar is commonly known as hyperglycemia. If you have take medication that may cause low blood sugar (hypoglycemia), it’s highly advisable to check your blood sugar levels before you try to bring your sugar levels down. This is just in case your blood sugar is normal or low, which can be the case in some situations. I’m going to go through, what to do to bring down higher blood sugar levels. The classic symptoms of high blood sugar levels are: feeling very thirsty, needing to keep going to the toilet, feeling tired, lethargic and irritable. Some of the symptoms of high blood sugar levels can be similar to low blood sugar symptoms, so if you’re on medication that can cause you to go hypo, then it’s best to test your blood sugar levels before trying to lower them. This is particularly important if you take insulin. If you’re on flexible insulin dosages and control your own doses, then you can use insulin to bring sugar levels down. Just be wary of an insulin that may still be in your body and don’t be tempted to over-correct. Walking may in fact be a better method than more strenuous exercise for some people, as it has been shown that some people’s blood sugar levels initially rise during intensive exercise. If your blood sugar is on the higher side, near 10 or over, your kidneys will try to take sugar out of your blood. Drinking water can help the body along with this. Just a word of caution. Don’t be tempted to drink much more than a litre of water in a short space of time, as, whilst rare, drinking too much water cn lead to water intoxication which can be serious. So, in summary, if you’re not on flexible insulin, your best bet for lowering blood sugar is to take a walk and keep hydrated. Download a FREE hyper factsheet for your phone, desktop or as a printout. Testing of blood sugar before bringing your levels down is particularly important if you take insulin. If you are struggling to keep your blood glucose levels under control, speak to your GP or consultant who can advise you or refer you onto a diabetes education course. If you take insulin, one way to reduce blood sugar is to inject insulin. However, be careful as insulin can take 4 hours or longer to be fully absorbed, so you need to make sure you take into account how much insulin you may already have in your body that is yet to be absorbed by the blood. Insulin that is yet to be absorbed by the blood is called ‘active insulin’. If you decide to correct with insulin, watch you don’t over correct as this can lead to hypoglycemia and can be dangerous, particularly so before bed. Exercise can help to lower blood sugar and walking is a good way of achieving this. It might make sense that exercising harder would have a better effect on lowering blood sugar therefore but this is not always the case as strenuous exercise can produce a stress response which causes the body to raise blood glucose levels. This response does tend to vary from person. When your blood sugar levels are running high, your body will try to flush excess sugar out of your blood through the urine. As a result, your body will need more fluids to rehydrate itself. Drinking water can help the body with flushing out some of the glucose in the blood. Just a word of caution to be sensible with drinking water; water intoxication (which can result in death) is possible if a number of litres water are drunk in a short space of time. This is rare and quite difficult to manage but it pays to be aware of this.